Spoil yourself! 5* Hotel in Mexico, All Inclusive, Flight from UK for €638! Thomson Holidays now offer incredible deals in Mexico for all flexible last minute travelers. 1 week (7 nights) in 5 star hotel in Mexico with All Inclusive, return flight from East Midlands in UK, and transfer to/from hotel is available now for only €638 / 521 GBP! 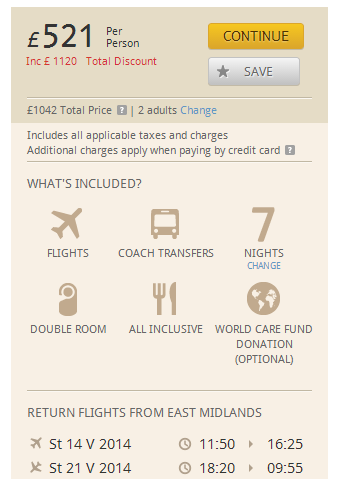 This is amazing price which you would normally pay for the flight alone! Departure from other airports in UK is also possible for slightly higher price: from Manchester (538 GBP), Newcastle (547 GBP) or London (881 GBP). The five star Hotel Riu Lipta is located in Playacar on Caribbean coast and it looks simply stunning. 20 kg check in luggage is included in the price. « HIT! Last minute flights to Fuerteventura for only €55!